When you are looking for affordable air conditioning repairs in Perth, look no further than Perth’s most experienced electrical company, Austec Electrical. Contact us for quick and reliable repairs, to ensure year round comfort in your home or office. When you’re used to living with air conditioning in your home or office, it’s no fun when it stops working. The air becomes stale and the environment can get very uncomfortable, making it difficult to relax or be productive at work. At Austec Electrical, we offer a comprehensive range of residential and commercial air conditioning repairs and maintenance services to ensure that your system operates at the most reliable and consistent level. 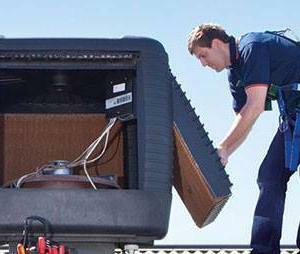 If you require air con repairs or simply want your system serviced, give our friendly team a call on 08 9379 9000. At Austec Electrical, we have more than 30 years’ experience working with air conditioning systems from the most popular brands in Australia. One thing we’ve learned over the years is that servicing is essential when it comes to maximizing the lifespan of your air conditioning unit. Regular servicing allows you to prevent malfunctions before they occur, ensuring that you never have to go a day without air conditioning. It is also an excellent way to make sure your system is operating as efficiently and cost effectively as possible. If the unit is low on refrigerant or has a water leak, causing a dramatic increase in energy consumption. Servicing your unit once a year could more than double its service life from 7 to 15 years – saving you money on a new system in the long run. Ensure the longevity of your air conditioning units with regular maintenance and efficient repairs, contact us today.